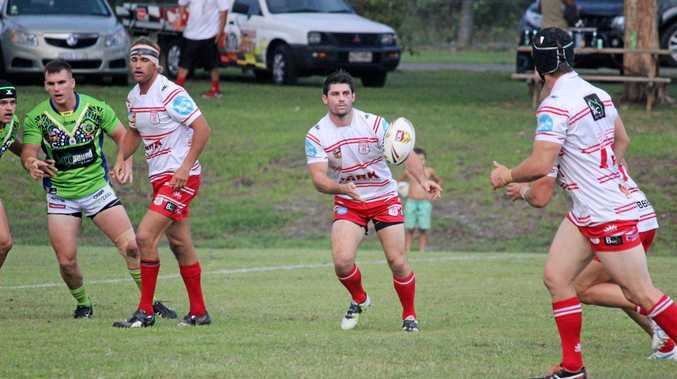 IN A game played in front of a packed house with a finals atmosphere Byron Bay Red Devils defeated the Tweed Coast Raiders 18-12 . From the get go it was apparent there would be no place to hide with both sides prepared to play up tempo footie in both facets of the game. The Bay were the first to strike when winger Gabe Belcher finished off a sweeping back line movement to plant the ball in the corner. The ever reliable Andrew Battese converted from the sideline and it was game on. The match was being played from end to end punctuated with big hits from both defences. The Bay were the first to concede when Tweed scored in the right hand corner, but they failed to convert. Once again both sides got back into the trenches. Tweed broke the stalemate with a try to hit the front for the only time in the game. The Devils hung on grimly for the last five minutes of the half holding back raid after raid. Halftime could not come quick enough for the Devils going to the shed with South Tweed leading 8-6. The Devils come out with renewed vigour for the second stanza, slowly establishing their ascendancy, not dominating but nevertheless asking questions of the opposing defence. Add to this the superb kicking game of Todd Carney who seemed to have the ball on a string, constantly turning the defence around with long raking kicks pinning the opposition down in their twenty meter area. Finally, the pressure told with a scrum set fifteen meters out from the try line. Andrew Battese playing out of the lock position picked up the ball from the rear of the scrum and sprinted over under the posts and then duly converted his try. With 12 minutes left on the clock the Devils were in again when centre Daniel Gibbons gathered a Todd Carney bomb, putting the Devils in a what looked to be a match winning position. But Tweed Coast had not read the script and with five to go they scored a late try. The last four minutes was white knuckle stuff with Tweed controlling possession on the back of a couple of errors from the Bay. The Devils withstood the late charge to run out worthy victors. No games over the Easter with Devils away to Cudgen the following weekend.